Question: When you’re in a room with other people, how can you tell if one of them is a pilot? Answer: Simple. He’ll tell you. Aviators are a proud lot, and with good reason. Ours is quite an exclusive club. Despite that fact, I’ve long believed that learning to fly actually has wide appeal among the general public. From my earliest days in the industry, those who discovered I was a pilot would invariably show great interest in my aeronautical activities. More often than not, I would come away from the conversation with the feeling that they were envious of my ability to defy gravity and soar with the birds. The question then is why more individuals don’t (as they say at Nike) “just do it”. For starters, it requires a lot of money. Then there’s the logistics, the time commitment, and the challenge inherent in weaving one’s way through the modern flight training maze. Changes in instructors, weather delays, antiquated tests and teaching techniques, and so on. Many look skyward, but few take the bull by the horns and see that dream through to completion. Ward’s post reminded me of something I’d almost forgotten: that I too once taught a homeless person to fly. In my case, the student was a fairly young man in his early 20s who already held a private pilot certificate. James ended up on my schedule because he wanted to fly acro. At our first meeting, there was no immediate indication that he was at all different from any other student at the FBO. His clothing and mannerisms were completely conventional. He was quite energetic about the aerobatic course and talked at length about how the ultimate goal for him in aviation was always the freedom and excitement of all-attitude flying. As with any new student, the process started with a bit of paperwork. When the forms were handed to me, I noticed he had left the “contact” section completely blank. No phone number, e-mail, or address. I asked about that and James said he didn’t have any of those things. He was couch-surfing in order to conserve every dollar possible for flying. He didn’t even own a car. This guy biked to the airport and worked in the pilot shop to earn money. How’s that for single-minded dedication? Couch-surfing is not illegal. Nor is riding a bike or lacking a cell phone. So eventually the training began, and as I recall, James was a pleasant and upbeat personality in the cockpit, not to mention a good stick. Every CFI craves students like that. You know, the ones that make you look brilliant without having to do too much work? Anyway, he was making respectable progress through the 10-12 flight hour course when suddenly things came to a screeching halt. He completely disappeared off the schedule, and despite asking around, I couldn’t figure out what happened to him. The guy just vanished into thin air. I was truly disappointed. Had my instruction been inadequate, I wondered? Did he finally run out of cash? Was he popped for selling meth or something? It wasn’t until a month or two later that someone informed me that he’d heard James was hit by a car one day while riding his bike to the airport. The only reason they knew that much was because James had taken the time to call the pilot shop and say he wouldn’t be able to make it in to work. Nobody had details, like which hospital he’d been taken to or how badly he’d been hurt. That was as close as I ever got to figuring out where he went. I’ve known other itinerant people, souls like kites who were simply meant to travel in whichever direction the wind carried them, but given the resources and support required for successful flight training, I was impressed with James’s dedication to a very challenging goal. It never entered his mind that it was unachievable, nor did I ever hear him complain about the lack of creature comforts in his life. He was flying, it made him happy, and that was all there was to it. In retrospect, his status may have been an advantage because James had no family or financial commitments to consume his resources or energy. He didn’t have much, but everything he did have was directed toward flying. I’ve no idea whether he ever completed aerobatic training, but unless that car seriously and permanently disabled him, I can’t imagine the answer would be “no”. It just wasn’t in his character to be deterred. How can you not admire that in a person? James, like all memorable students, wasn’t just a learner but a teacher as well. He taught me a valuable lesson about persistence and dedication, two very American qualities which have become the exception rather than the rule in our society. Whenever someone tells me they could never possibly find the time or money to pursue flying — or any dream for that matter — I always think about James, and I know the truth: if there’s a will, there’s always a way. Dear Ron: Your story really touched me. It never occurred to me that homeless people would spend the time and money learning to fly. I would thing they were more concerned about their next meal. Glad you enjoyed it! And yes, you’d think a homeless person would have “higher” priorities. Perhaps he’d best be described as homeless but not destitute. He could have applied his money toward housing instead of flying, but as long as he was able to get a roof of some sort over his head each evening, that’s was sufficient. The term “homeless” now has a connotation of meaning helpless or hopeless instead to lowering your standard of living while working toward a goal. Thanks for the account. Exactly. He was homeless in the most literal sense, but certainly had more resources (which he earned) than those who we typically think of when the “H” word is used. Definitely not your typical student pilot, though! Great story. It’s too bad we don’t know the ending, I hope the bike accident wasn’t serious. That makes two of us! Thanks again for inspiring me to tell the tale. Your posts are consistently excellent — but this one really stands out. It was especially moving, insightful, and compassionate. Thank you so much. I will carry its lessons with me as I pursue my dreams. Wow–thanks for the high compliment! It’s much appreciated. Great post, Ron! I’m always keeping an eye out for such exceptional inspirations as your James. I agree with you and wwelvaert, wish we knew the ending of the tale, but there’s no doubt if he’s physically able, he’s still flying! What stands out to me is that, with the connotation “homeless,” it’s almost as if flying was his addiction. But, in this case—unlike meth or its ilk—most of us would consider this a “healthy” addiction. W/no family ties, what’s your choice: a roof over your head, or wings in the sky? We could see ourselves doing the same thing! I hadn’t thought of it that way, but you’re right: experts tells us that many homeless people have serious addictions, so it shouldn’t be too much of a surprise that James (not his real name, by the way) would choose wings over a fixed address. Those of us with families don’t have that options since we’re responsible for the welfare of others. I got the sense that his liberation came from more than flying. It was also from the freedom to choose how he was spending his time and money. Most of all, he was happy. And because of that, I was happy for him. Captain Kirk extends his felicitations! In a society where pilots tend to be broadly painted with the “wealthy fat cat” brush, I have often held that most of us make financial sacrifices in other parts of our lives to follow our dreams of flight. Your example takes this idea farther than I ever imagined possible. Thanks for sharing. Excellent post, as always. Actually, this post just made me sad. I found it from the December 10, 2014 Aviation e-brief and it appeared just a few lines above the “How much flying do you do for work versus pleasure?” poll where the “Only fly for pleasure” option won in a landslide with 55.99% Second was the “Mostly fly for pleasure, sometimes for work” option with 20.10% of the vote. While it may be inspiring that someone would go so far out of the norm to pursue their dreams, the darker message is that flying for fun will require huge sacrifices. This hits pretty close to home for me as a student pilot after having spent many thousands of dollars and hundreds of hours pursuing this hobby over the last few years. Adding up all the disappointments (weather, maintenance, the breaks in training from running out of time/money) and comparing it to the few fun times really makes me wonder. If it’s something that’s supposed to be fun, why is it so painful? I shared some of those frustrations when I first started, R.E. Weather, maintenance, scheduling, runway reconstruction… there were more than a few aggravations. Most aviators can probably relate. Learning to fly does require significant sacrifices. And you’re right, it’s not always “fun”. It’s marketed that way, and we like to think of it as a purely enjoyable activity. Otherwise why bother, right? But the reality is that there are items to be studied, homework to be done, tests to be taken, skills to be mastered, etc. And like any serious educational endeavor, it can be taxing. But I’ve known a lot of pilots over the years, and not one has regretted the time, money, and effort they put into achieving that certificate. On the contrary, most would say it’s one of the crowning achievements of their lives. If it makes you feel any better, once your training is complete it gets easier and cheaper. No instructor to schedule or pay for, for one thing. No more syllabus to guide your activities — you can start flying to places and with people of your choosing. So stick with it — it’s worth it in the end. And if you’re really not having fun, let your instructor know. There might be something they can do to help. A very interesting and compassionate story. I don’t think I’ll ever look at a homeless person the same way again. The key to James and his ability to do what he did was the fact that he had no other commitments.. no corporate job, no wife, children or any of the major responsibilities that go with working in the corporate world or raising a family. So, his out of pocket living expenses were probably very minimal. When I began my flight training, I was enlisted in the Navy back in 1988. I was an avionics technician, working on P-3 Orion NAV/COM systems. 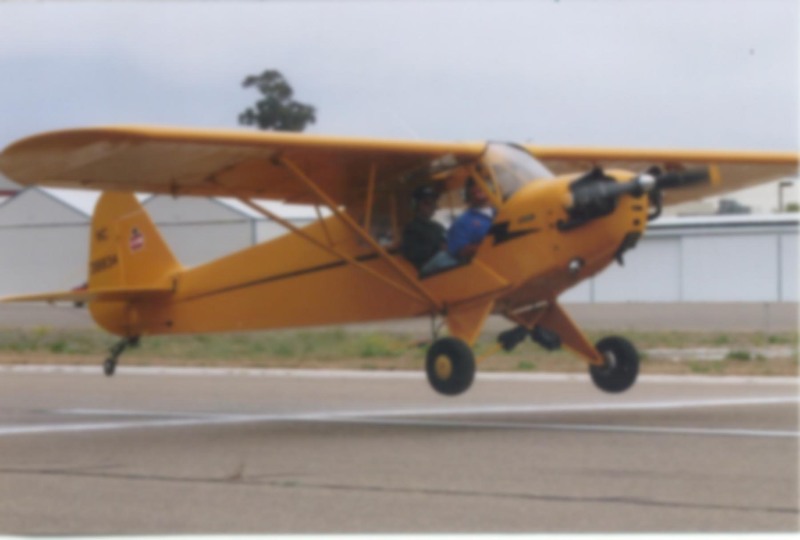 I took advantage of the Navy Flying Club that was located on base at the now defunct NAS Moffett Field. The club had a substantial rental fleet of about 10 aircraft. Two C-152’s, three C-172’s, one Piper Warrior, one Piper Archer, one Mooney, one Beech Baron and a T-34 Mentor that was borrowed from the nearby Monterrey Navy Flying Club, Wet, hourly rates for the C-152 and C-172 ran $28 and $35 respectively. A primary instructor ran $10 an hour, for a total hourly training rate of $38 – $45 an hour in 1988 dollars. Fuel was subsidized as we shared the airfield (and the club) with NASA’s AIMS Research Center, so it was provided at a deep discount. Very affordable by today’s standards. As an E-3, I didn’t make much money. In fact, my newlywed wife, (who, by the way, is still with me after 26 years), offered to work a second job just so I could have enough money to fly and obtain my ratings as I began the pursuit of a career as a professional aviator. It was all going well until I left the Navy a few years later to finish college and start a family with children. My priorities changed and I ended up pursuing a career in IT instead. Why? Because success came much easier in that field than in aviation. It took me just 5 years to start making a six figure income in IT whereas, it may have taken me a lot longer flying as a professional pilot. My professional aviator friends tell me that it takes not just skill, but some luck to make it as a professional pilot today. You literally have to be in the right place at the right time to land the right job. If I only knew then what I know now about how costly aviation is to pursue as a career or as a hobby. Not just in finances, but in personal sacrifice. Still, I am grateful for the experiences I have had as an aviator. In case you’re wondering, I still fly.. but I fly with others who either own their own or rent. I’ve flown everything from a Stearman to a T-33 and have logged time in Boeing 737, 757, 777 and Airbus A-319 and 321 simulators thanks to my aviation connections. Thanks for sharing and have a Merry Christmas. Thanks for sharing your story, Gordon! Those are impressive numbers. Of course, you can bank of the fact that thirty years from now, pilots will look back on our $150/hour rates for that same Skyhawk and marvel at how cheap it was. Your path from flying to IT is identical to that traveled by many others. James’ life was very simple because he had no mortgage, wife, or kids. Perhaps today he’s got all that stuff — and more. At the very least, he took full advantage of that unencumbered period to achieve his dream. Although the old saying is true, “the harder I work the luckier I seem to get”, your professional aviator friends are right: it’s better to be lucky than good! I’ve been very lucky. Some pilots actually make it to the professional flying stage and still end up pursuing another field because the working conditions and wages are low. I’m glad you’re still involved in aviation. There are countless ways to do that. Gliders, ultralights, LSAs, simulators, CAP, friends, museums, volunteerism, and so on. Ron, once again, you’ve brought back memories with your insightful study. Reminds me of having to give up my flying after getting married, (fifty years ago now.) Oops! Forgot actually starting before I even got my drivers license, but that was put on hold for Uncle Sam. When I finally retired, (the first time,) the wife told me it was time to go for my biggest lifelong goal, my PPL. Started, then 9/11 happened and everything got put on hold. Luckily, the instructor I was now working with was persistent, and a year later, (plus 15 days,) I managed to win that goal. Now, once again, that pleasure is on hold, courtesy of the politicians and other costs, (no local rental fleet, airport management not friendly toward GA, (along with their county airport owners,) and a few other problems not insurmountable. The leading problem is COST. This post reminds me of the thousands of climbers who are so committed to their goals that they have sacrificed the accouterments of middle-class life in order to pursue their passion. Ron, until your post I never thought of that sub-set of climbers as “homeless”, even though they are camped out all over the world in vans, tents, cars, couch-surfing, etc., saving up money towards their next big Himalayan, Alaskan, or Andean adventure. Like “Patrick”, a number work in construction because of the seasonal, temporary nature of those jobs. I guess I still don’t really think of those climbers as homeless, even though technically they are. It’s the same for the two men cited in your post. I see them all as sacrificing short-term comforts (even relationships) for long-terms goals. To do that is certainly not for the faint of heart. I find that degree of passion and dedication inspirational when pondering how I work towards my own goals. Great story, I often question myself and my comfort and I am blessed to fly and maintain a career that help fuel that fire.